So yeah, I did that 20 mile long run on Sunday and when I finished that it signaled the official start of my taper. This will be my second marathon taper so I’m kinda like whatever. I remember last year being really antsy and having mysterious leg pains. I’m still not sure if the leg pains were real or psychosomatic. This year is till too early to tell since I’m just in the first week and the drop in mileage hasn’t been dramatic. Next week may be a different story. I started my taper this year with a Snickers bar because I couldn’t find a cupcake. Then I went home showered and ate a burrito. Then I napped. Chely Wright signed my bib last year. Also, during last year’s taper I went and did a whole bunch of cultural things that involved Cherry Jones, Rosanne Cash, and Chely Wright (not all together). So far this year I have Audra McDonald on tap at Carnegie Hall on Saturday night. There may a trip to the opera and other events that don’t tire me out. I also plan to eat a lot of chicken pot pies and macaroni and cheese. I have determined that these will make me run well. Plus it’s great weather for these enjoyable comfort foods. What do you do during your taper? 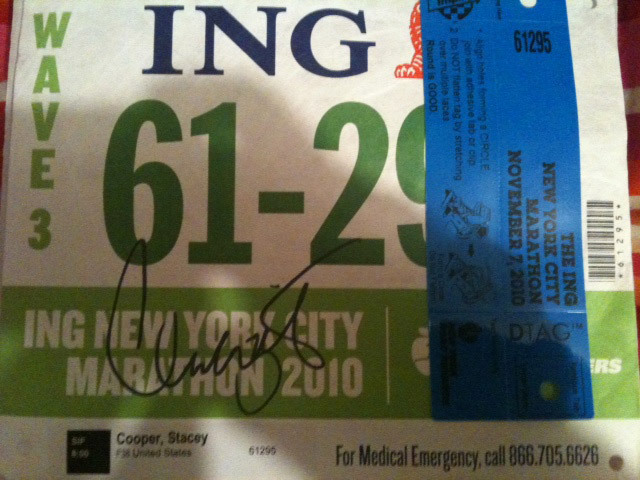 This entry was posted in NYC Marathon, running and tagged Audra McDonald, Carnegie Hall. chicken pot pie, Chely Wright, Cherry Jones, cupcakes, food, macaroni and cheese, NYC Marathon, Rosanne Cash, Running. Bookmark the permalink. 1 Response to Taper Time! My taper is a bit less mileage than I would like because I’m fighting a bi of a stomach bug. But hopefully it won’t matter too much come race day!